WHEN Hunter Drama students were in the United States in January this year, New York’s Juilliard School of Performing Arts topped the list of places they wanted to visit. 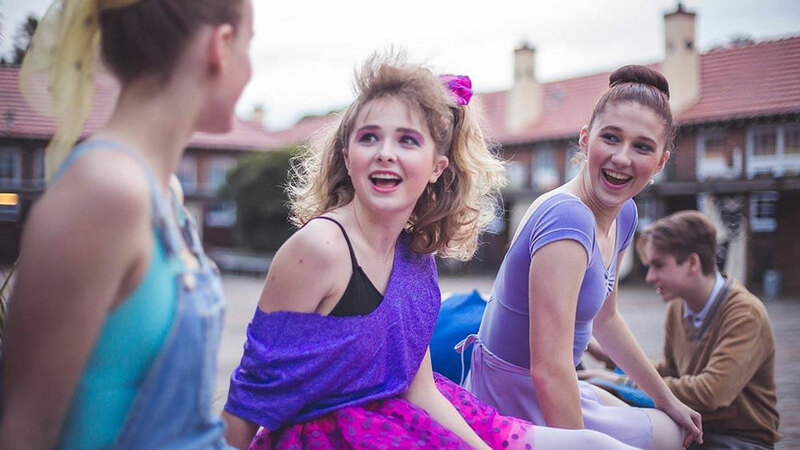 The teenagers had been cast in a Newcastle production of the musical Fame Jr, which is set in a New York training centre similar to Juilliard, so seeing that establishment and talking to its teachers and students helped them to develop their characters. Theatregoers will see the results of that experience when Fame Jr is performed at the Civic Playhouse from July 1 to 4. The lively musical shows how students from diverse backgrounds cope with the learning process over the four years of their classes in acting, singing, dancing and playing musical instruments. It also looks at the issues that arise in their coming-of-age relationships, with romance helping to enrich their performances on some occasions, but causing uncertainty at other times. Sofia Nolan, who plays Carmen Diaz, a girl who believes she is headed for stardom, sees it as a fun musical and one that requires high energy on the part of cast members. She is one of 32 cast members aged 12 to 18, with the script adapted to a brisk 60 minutes from a longer adult version known as Fame. The musical has an interesting history, showing its popularity with many types of audiences over the past 35 years. It began life as a film musical in 1980, with the story set in the then New York High School of Performing Arts, an institution that was merged with another performance school in the mid-1980s. The film led to a television series that ran for six seasons, then a stage musical which premiered in 1988. The stage work was substantially rewritten and had an almost entirely new score, though retaining the early 1980s setting and the hit title song. There was a new film version in 2009, and Fame Jr hit the stage in 2012, again with some songs replaced by others. Fame Jr has had more than 200 productions in the United States since it premiered. Shane Bransdon, the director of the Hunter Drama production, said it is a musical with appeal for all ages. ‘‘The humour and colour will appeal to young children, and the 1980s setting, with props including rollerskates and a Polaroid camera, will engage older people,’’ he said. Audience members will become engaged in the show before they head into the Playhouse auditorium. Improvised auditions for entry to the performing arts training school will be held inthe foyer to set the scene. As well as fame-obsessed Carmen, the students include ambitious actress Serena (played by Maisie Owens), wisecracking comedian Joe (Camden Aglio), quiet and likeable violinist Schlomo (William Parker), and talented but troubled dancer Tyrone (Erik Mackintosh). Tyrone is attracted to fellow dancer Iris (Bonnie McPeak), who pretends to be wealthy; Nick (Tom Rodgers) is passionate about ‘‘real acting’’ and has an eye for Serena; Grace ‘‘Lambchops’’ Lamb (Laura McLeod) is a drummer with a lively personality; Goodman ‘‘Goody’’ King (Harry Lyddiard) is a talented musician who needs to develop confidence; and Mabel (Kacie Bourke) sees the need to diet as getting in the way of her acting. The performing arts teachers are played by Adam Grosen, Isabel Kelly, Jordan Warner and Naomi Dingle, with large dance, music and drama ensembles also featured. Annie Devine is musical director and James Tolhurst choreographer. Fame Jr opens on Wednesday, July 1, at 7.30pm, with performances daily from Thursday, July 2, to Saturday, July 4, at 2pm and 7.30pm. Tickets: $32, concession/junior/student $28. Bookings: Civic Ticketek, 49291977.